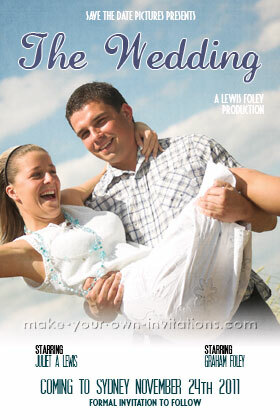 Make a statement with these very cool movie poster save the date photo cards. This Save the date will feature a full sized photo of the couple to be. The title of the 'movie' will be featured along with the names of the happy afianced couple. At the top of the card is the text 'save the date pictures presents' this can be changed to read the text of your choice - eg 2 Cats Pictures, Getting Hitched Studios, Two Kids Pictures etc. The movie is starring the Brides name and the Grooms name at the bottom. Also featured at the bottom is the Date and location for the wedding and a note that a formal invitation is to follow. Send us your photo to be transformed into a fun and informal save the date card for your guests.